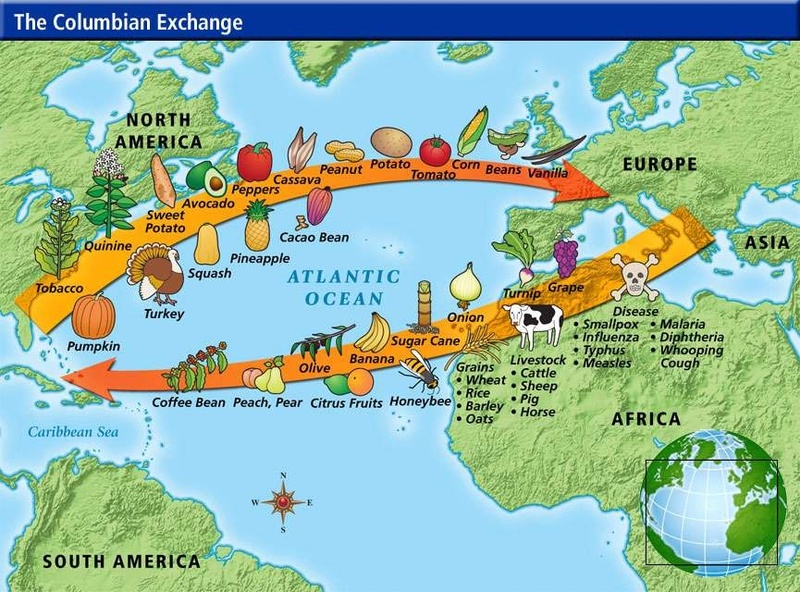 One of the most far-reaching effects of Christopher Columbus’s discovery of the Americas was the so-called Columbian Exchange, the exchange of plants and animals (and bacteria and viruses) between the Americas and the rest of the world. This map shows some of the major crops and livestock which made the journey in either direction between the Americas and Europe. We see, for instance, that the tomato crossed to Europe from the Americas, along with the turkey and corn (and possibly syphilis), while the cow, the horse, and the onion, went the other way, along with smallpox, measles, typhus, and a whole series of other diseases (the diseases nearly wiping out the Amerindian populations). 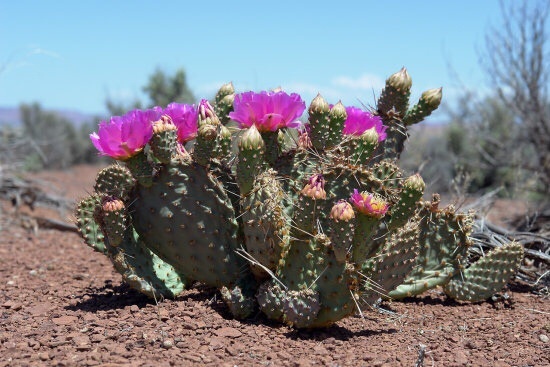 But I want to focus on a plant which normally doesn’t get mentioned in discussions of the Columbian Exchange: the prickly pear, a plant whose history is very much centered on Mexico. 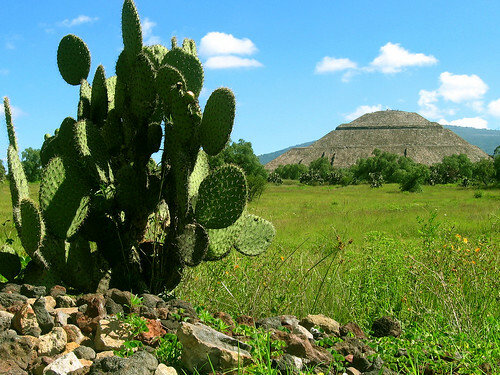 Here, we have an exemplar standing guard, as it were, at the site of Teotihuacan. 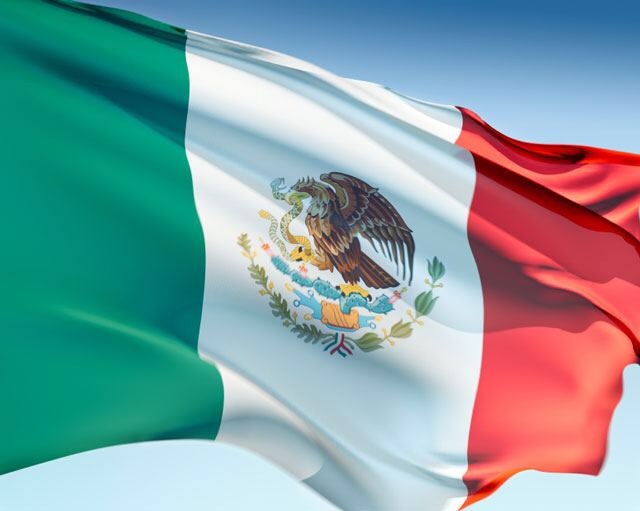 In fact, the prickly pear is so centered on Mexico that it graces the Mexican flag as part of the latter’s central emblem (for those with “mature” eyesight like mine, it’s what the eagle is grasping with its talons at the same time as it grasps that snake in its beak). 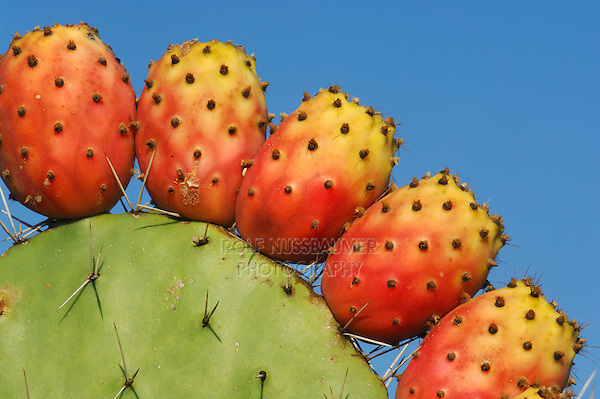 Maybe the prickly pear’s low profile in Columbian Exchange discussions is because it’s such a nasty, spiny plant, which really doesn’t endear itself to anyone. Or maybe because it’s not much of a commercial crop; the Food and Agricultural Organization, which collects global statistics on some 160 crops, collects no statistics on the prickly pear, for instance. Whatever the reason, I wish to right this injustice and pay tribute to the prickly pear and its role in the great Columbian Exchange. 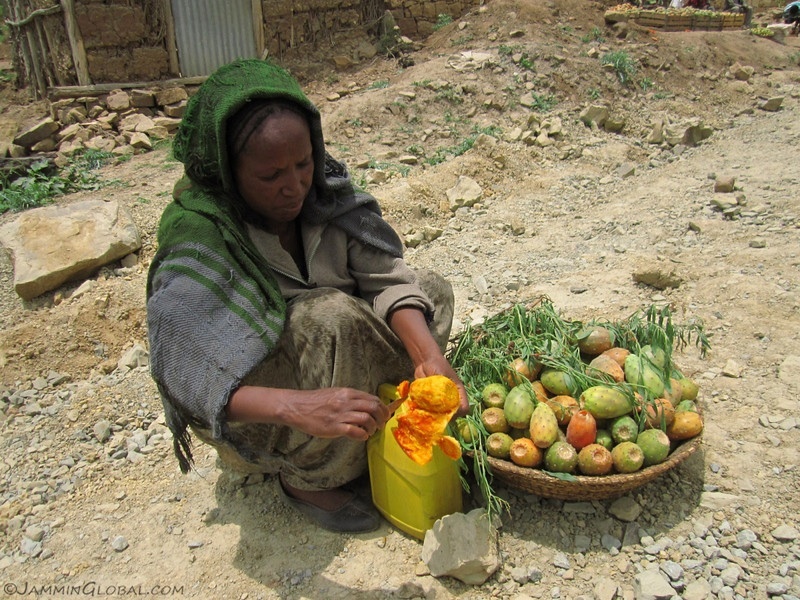 It may perhaps have played a modest economic role, but it helped to fill many an empty stomach, and it sure as hell has played an important ecological role, sometimes wreaking havoc in the ecosystems into which it was thoughtlessly thrust. 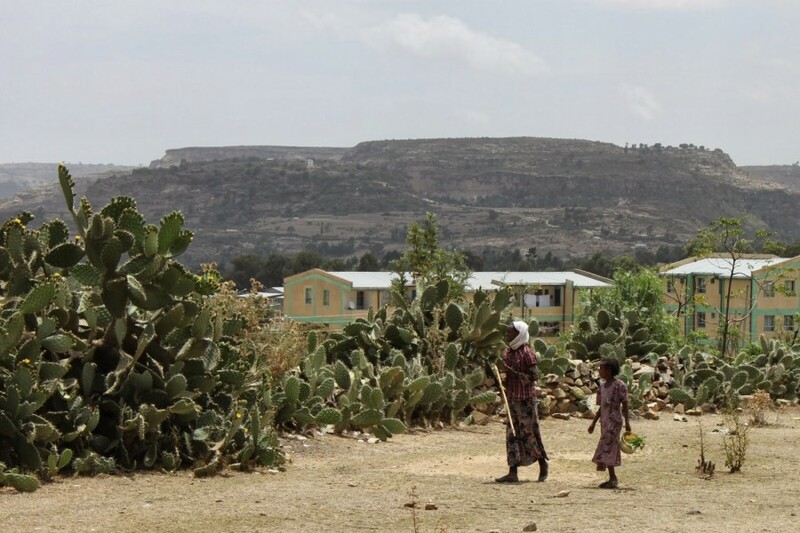 I first met our prickly friend in the country of my birth, Eritrea. Here, you see a specimen in front of the delightful little train which runs from Asmara down to the seaport of Masawa on the Red Sea. I have a vivid memory of taking that train to go down to the coast for a holiday on the beach. introduced the prickly pear (please note the plant waving at us from behind the colonial troops and their Italian officer). 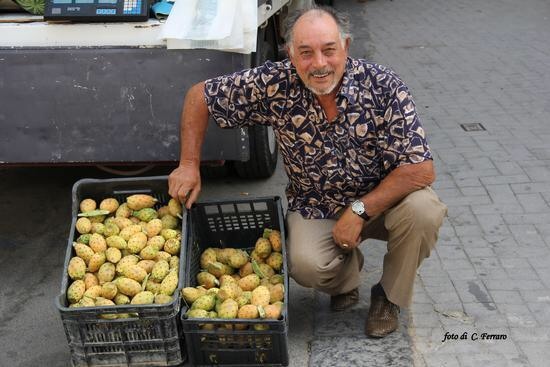 The Italian colonialists brought it from the mother country, of course, where it grows in profusion in the more arid southern regions of the country. 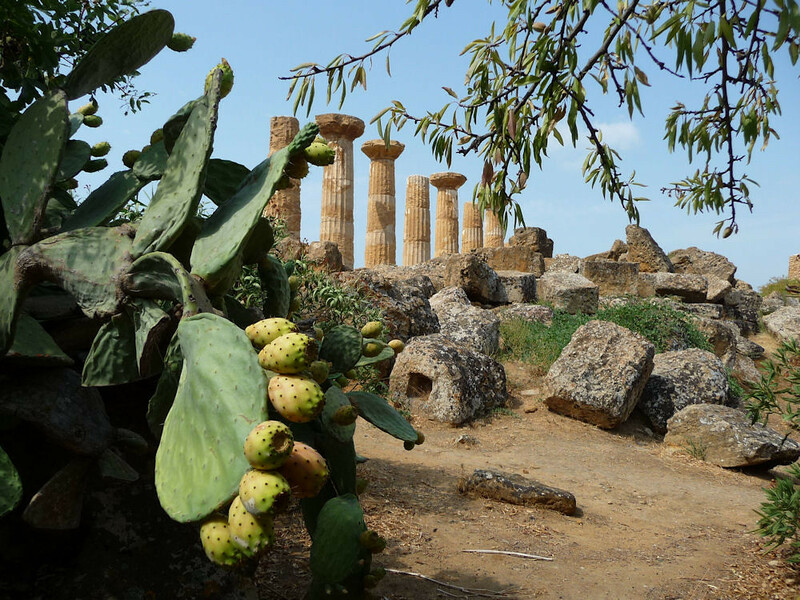 We have here an example gracing the ruins of Agrigento in Sicily. 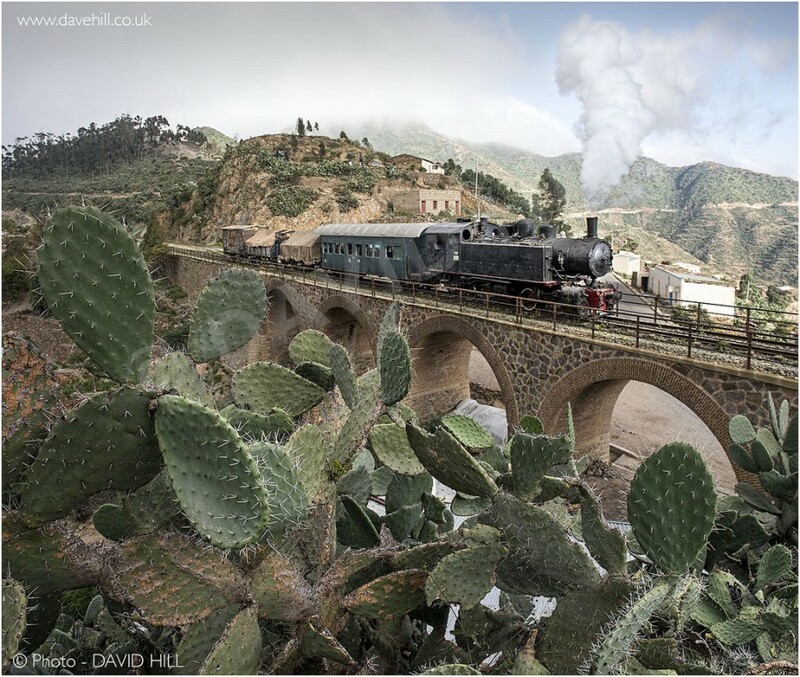 But southern Italy was just a later stop on the prickly pear’s journey out of Mexico. It must surely have reached Italy from Spain, which was the first port of call for many of the biological journeys out of the Americas. 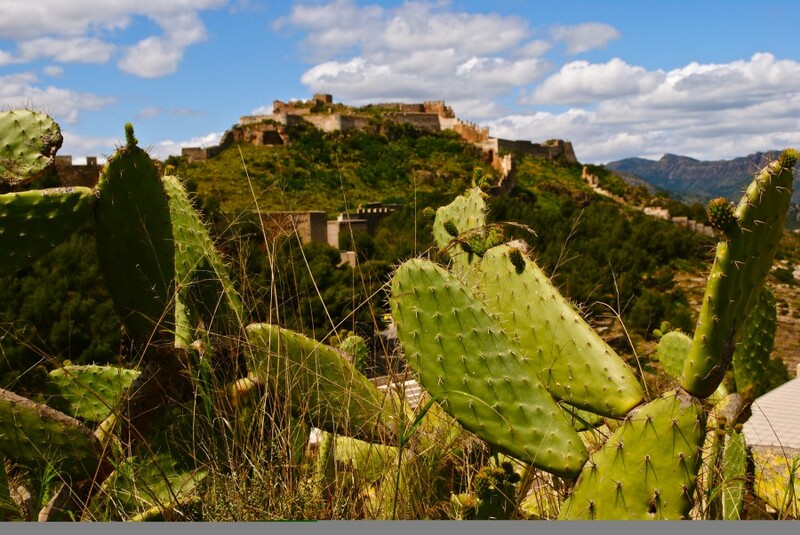 Here we have a Spanish prickly pear, nudging its way into a photo of Sagunto castle in the province of Valencia. especially when its population levels begin to explode out of control in some foreign ecosystem which has no natural biological defenses against it. 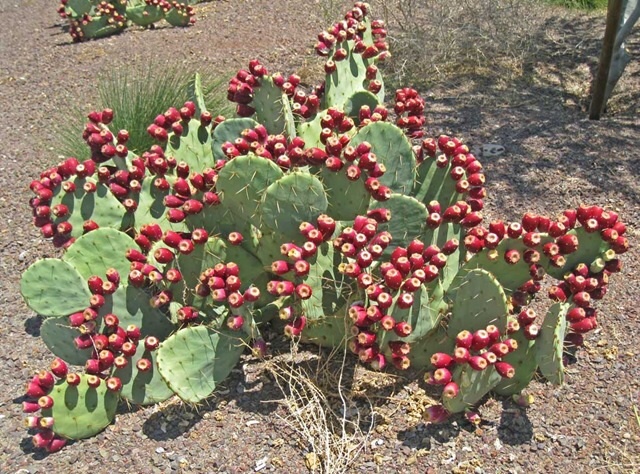 The Global Invasive Species Database lists several countries where the prickly pear is now considered an invasive species. 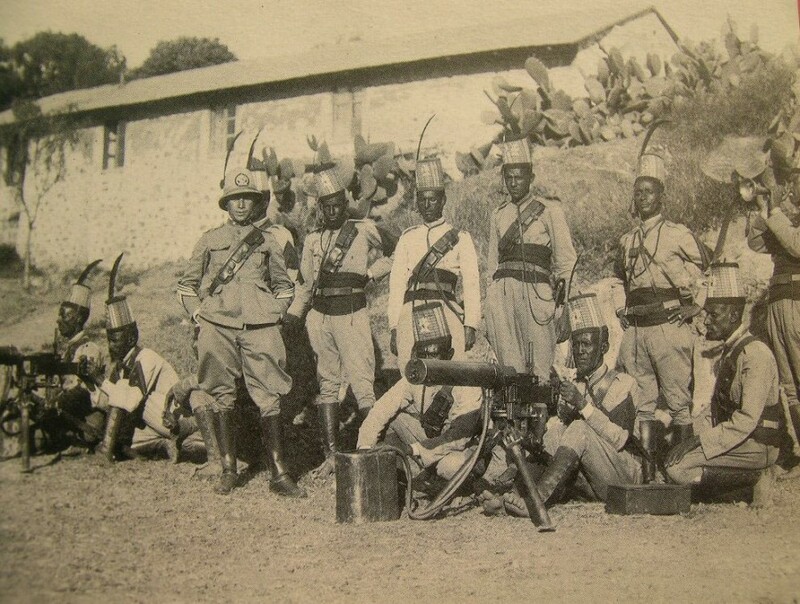 Eritrea is one of them, along with the neighboring countries of Ethiopia and Somalia – the Italians, who colonized all three countries had little idea of the damage they were wreaking. 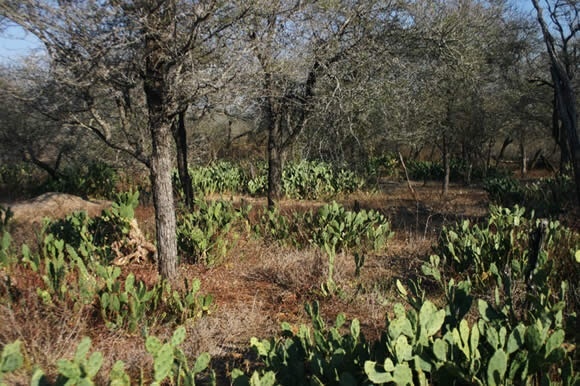 But South Africa also considers it an invasive species (here is a picture of prickly pear invading the Kruger national park). And Australia had a catastrophic invasion. 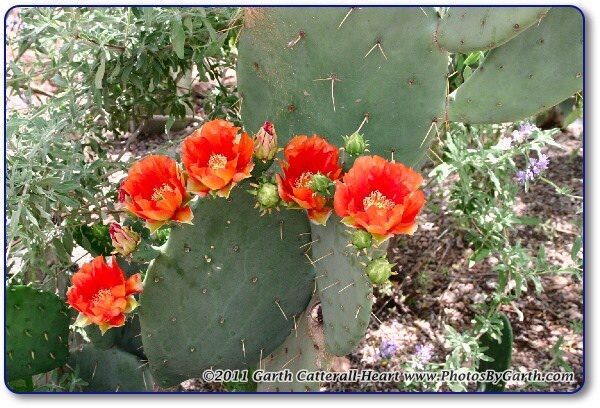 The prickly pear was initially introduced as an ornamental plant for gardens. Then some bright spark thought of using the plant as natural fencing (sensibly enough, cattle and other animals desist from pushing through breaks of prickly pear because of the nasty spines, and they don’t eat them for the same reason) and to start a cochineal dye industry (the little beasties from which the dye is extracted munch the prickly pear’s pads). 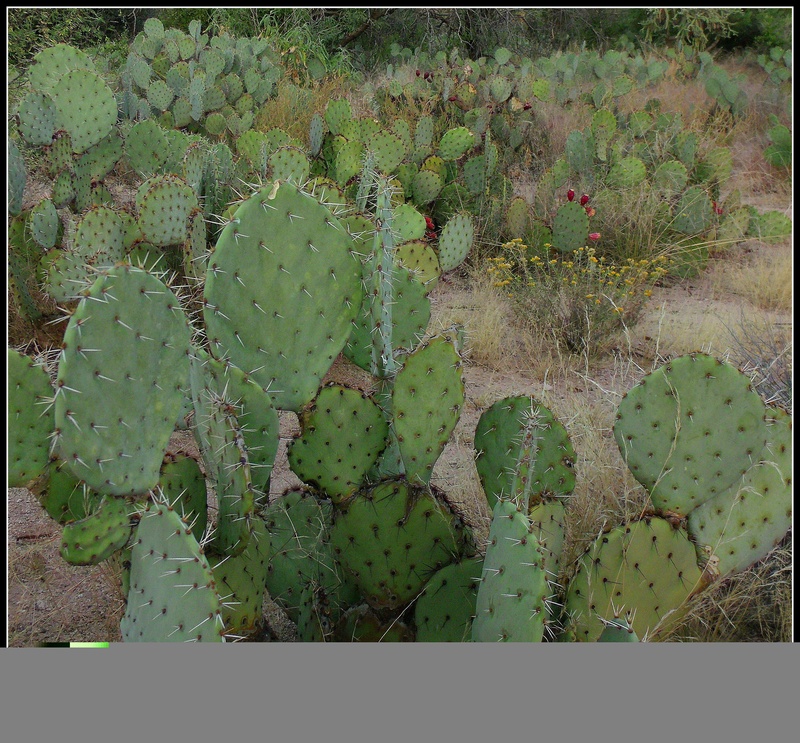 But the prickly pear went crazy. It eventually converted some 260,000 square kilometers of farmland (which for those readers, who like me don’t think in square kilometers, is more or less equivalent to a square 500 km by 500 km) into an impenetrable green jungle. 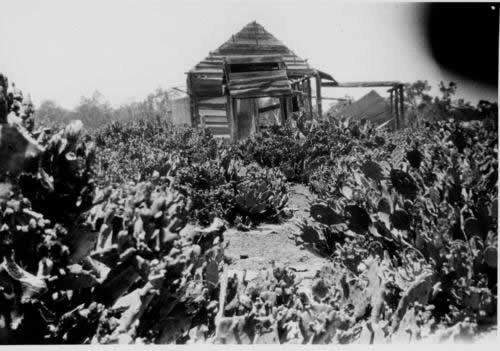 Farmers were driven off their land by this “green hell” and their abandoned homes were crushed under the cactus growth. The authorities finally managed to get the plague under control in the 1920s by introducing a South American moth, the Cactoblastis cactorum, whose larvae feast on prickly pear. This led to a crash in prickly pear populations, and while the plant has not been eradicated from Australia it has been brought under control (the Australians were lucky, by the way; there is always a risk in this kind of biological control that the agent will find another native plant much more to its liking and wipe that out instead, or once it’s dealt with the original pest will turn its hungry eye on to something else and become an invasive species in its own right). 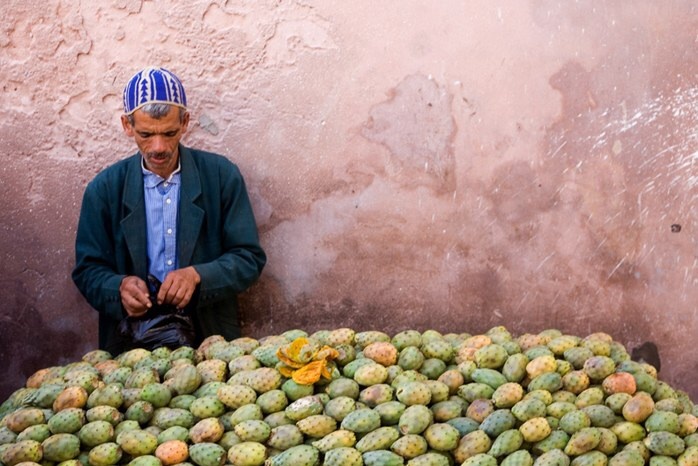 Why did some Spaniard ever bring the prickly pear back to Europe in the first place? Because, as far as I can tell, he thought he could brighten up a Spanish garden somewhere. But it cannot have been because of the beauty of the plant itself. 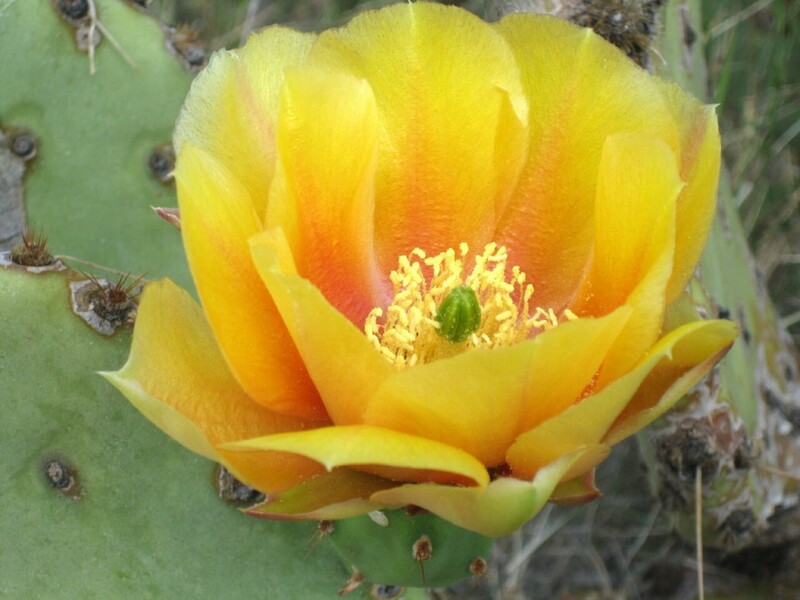 More likely it was the flowers, for indeed the web is full of pictures of the flower of the prickly pear. Here are a few of the more pleasing examples. These had been enjoyed by the Mesoamericans for millennia before Hernan Cortes and his conquistadores arrived and have been enjoyed by the Mexicans ever since. 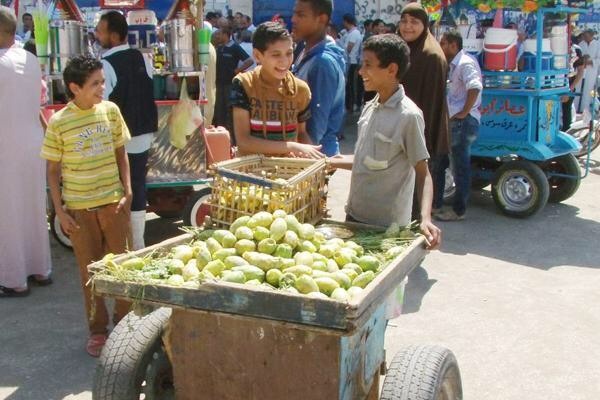 and I had liked them – a little too many seeds perhaps but nicely fresh and sweet. Personally, while I like the taste, that early brush with glochids has always made me wary of the fruit. The pain in the hands was bad enough but the thought of those things getting stuck in your tongue or gums because the fruit was badly cleaned is dreadful. And the thought of them getting stuck in your throat is simply too horrible to contemplate. As readers can imagine, over the centuries people in the countries where the prickly pear was introduced eventually got around to putting the fruit into alcoholic drinks – at least in those countries where such drinks are tolerated. Thus, we have a prickly pear-flavoured liqueur called “Ficodi” in Sicily, we have a prickly-pear flavored herbal liqueur called “bajtra” in Malta (another country, by the way, where the prickly pear has been declared an invasive species), out in the lonelier reaches of the Atlantic, on the island of St. Helena (where Napoleon Bonaparte was banished), the potent “Tungi Spirit” is produced with the fruit, while prickly pear fruit is the main ingredient of a popular Christmas beverage in the British Virgin Islands called “Miss Blyden”. Looking at how all these various drinks are made, I think I would plump for Miss Blyden: prickly pear steeped in rum and sweetened with sugar. Mmm, sounds good …Yohoho, and a bottle of Miss Blyden, is what I say. But actually, these drinks are all derivative, if I can put it that way: you just plunk prickly pear fruit in an alcoholic medium; it could actually be any fruit that is plunked. 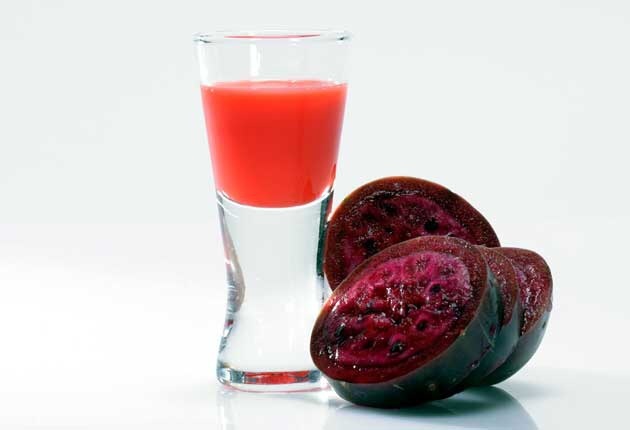 The Mesoamericans, on the other hand, came up millennia ago with colonche, an alcoholic drink using just the juice of the prickly pear fruit, fermenting it over a number of days. I have read that it is a sweet, fizzy, red beverage. Here’s a photo of a glass of colonche, together with the fruit from which it is derived. I regret to say that I did not try the drink while I was in Mexico. However, I have asked my son to try it and report back. If the feedback is good, we can discuss about getting into the business of exporting it! What I will not promote, through export or otherwise, is the eating of the pads (that is to say the fleshy leaves) of the prickly pear. They eat them in Mexico – and in New Mexico too (and perhaps some of the other southwestern States of the US). The original peoples of Mexico were eating them when Cortes burst in on the scene, and it’s still quite popular. 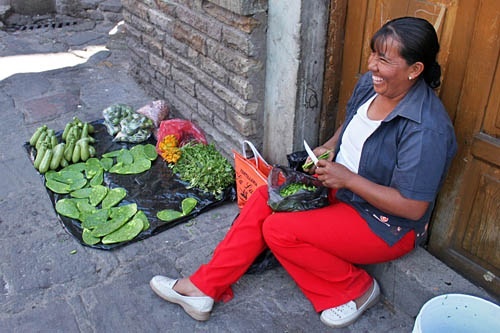 I saw them sold in the supermarket around the corner from where we were staying in Mexico City and took a photo, but I prefer this more sympathetic photo of a Mexican lady on the street selling them. 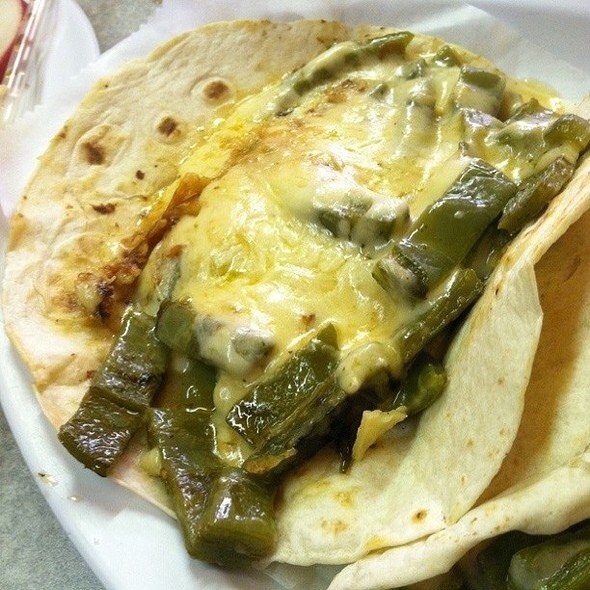 I mentioned in an earlier post that I had tried the pads, cooked and with melted cheese, in a taco. I also tried them, with cheese but without the taco. It didn’t change the taste much. I’m all for trying things once (with the exception of insects). But not necessarily more than once. 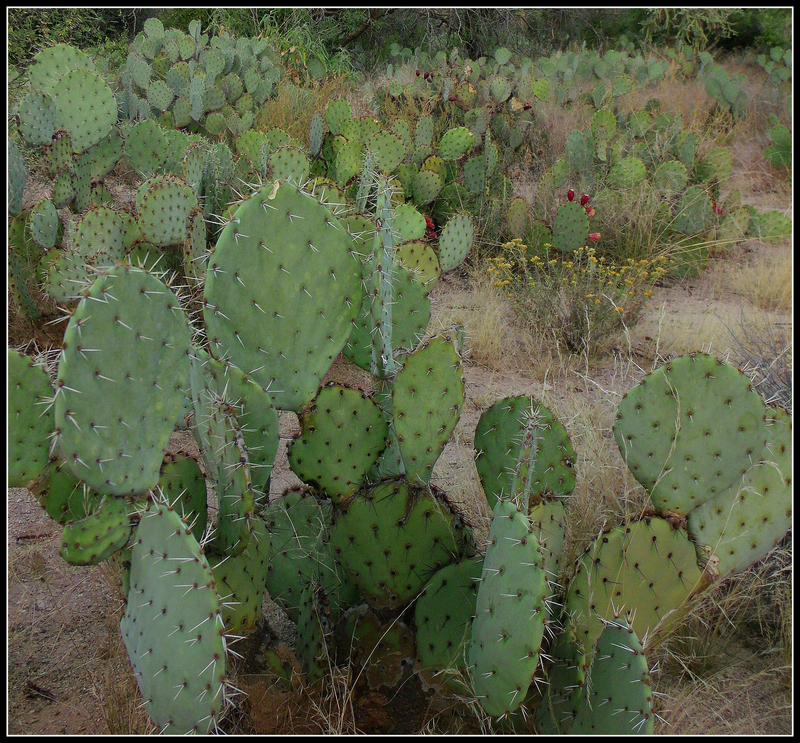 Pads of the prickly pear fall into the latter category. But who knows? 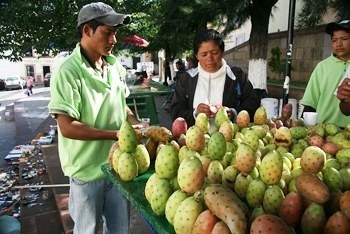 As the Mediterranean countries slowly go down the economic drain, and more generally as we 99 percenters slowly get poorer, perhaps we will join our Mesoamerican friends and start eating prickly pear pads – as the poor of the Mediterranean lands turned to the fruits of the prickly pear some three hundred years ago to fill their empty stomachs.